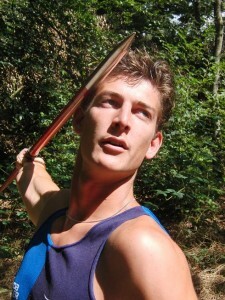 In 2001 Mart ten Berge began practising athletics. He soon showed talent at the javelin. This led to him specialising in that branch of athletics. This specialisation has been rewarded with several podium places at the Dutch championships since 2007. In 2008 he enrolled with the Academie voor Lichamelijke Opvoeding (ALO) in Groningen, and in 2011 he began working as a sports instructor at the ALO. Because he was able to combine his heavy training regime with his studies, Mart was asked to become a member of the Groningen Talent Group, which is a group of the 100 most talented young people, chosen from 50,000 students and citizens of the city of Groningen. Mart graduated on research into physical detraining for elite athletes. Therefore, this javelin thrower and sports instructor will be mainly focussing on the detraining topic on Extopsporter.nl.